For some odd reason many technical people seem to have a taste for sweet alcoholic beverages. The problem is that you often buy a bottle of some designer liquer, have a shot or two and then the bottle sits in the cupboard for ever more. 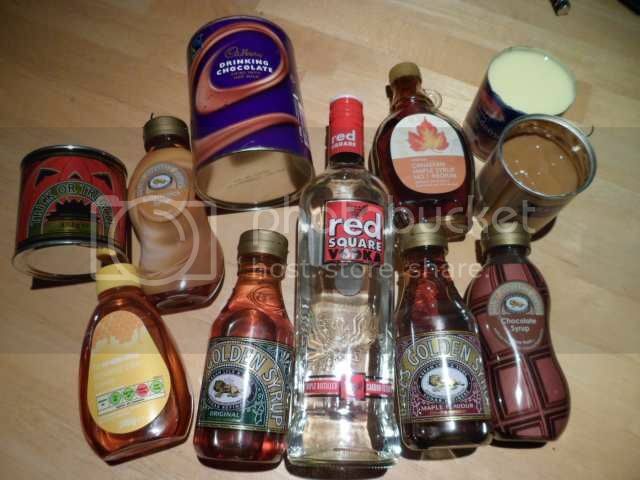 On this page we're going to explore customised liquers made with a base alcohol with various commercially available syrups and sweet things added. By making them in very small amounts it means you can try lots of different types to find your favourite without filling your cupboards with expensive commercial liquers. This project is strictly for those of a drinking age (alcohol usually tastes awful to young people anyway) and is a way to get lots of variety from a single cheap bottle of generic spirit. The project carries a risk of alcoholic overindulgence and possibly nausea and headaches. It's useless trying to warn you not to do dangerous things while intoxicated because the article is probably going to be read by the sort of people who get a bit tiddly and then poke about inside live mains equipment in their workshops. Wikipedia defines a liquer as an alcoholic beverage made from a distilled spirit with added flavours and sugar. It doesn't matter what fancy liquer you buy, it's going to be largely water with ethanol (drinking alcohol), flavourings, colourants and lots of sugar in some form. Some liquers genuinely use an infusion of herbs and spices, but many are nothing more than a base alcoholic sugar-syrup with candy-like flavours and colours added. You didn't think there was actually banana in creme de banane did you? Or that blue curacao is a natural colour? To make these flavoursome potions alcoholic we need a general purpose drinking alcohol base. It doesn't have to be expensive as the prominent flavour will be from the sweet substances we'll be adding to it later. General purpose supermarket brand rum and vodka are a good choice. They're just a convenient bulk fermented and distilled form of ethanol. Check the label to ensure you are getting around 37.5% alcohol by volume. This is fundamentally the ethanol to water ratio and indicates the strength of the spirit. The percentage may vary from country to country. It goes up in decisive steps because of the way government duty is levied on spirits according to their potency. This means distillers have to dilute the ethanol to specific levels to avoid crossing expensive duty thresholds. Although these tipples can be made with full strength vodka, you may wish to dilute them with water, since many of the designer liquers often have a much lower ethanol content. It's a case of experimentation to see what you like. You may enjoy the "bite" of a stronger drink, or you may prefer to savour a few weaker ones. 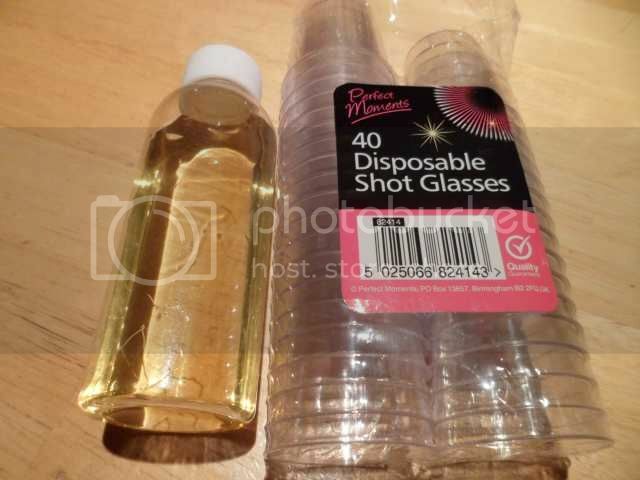 Since we're going to be making small test batches we'll use small bottles with liquid tight lids for shaking the alcohol and syrups together and small shot glasses to test them. Typically we'll be using just about 10% syrup and the rest as vodka. But that's entirely down to your preference. Let's start with a rather odd and seemingly dubious choice. 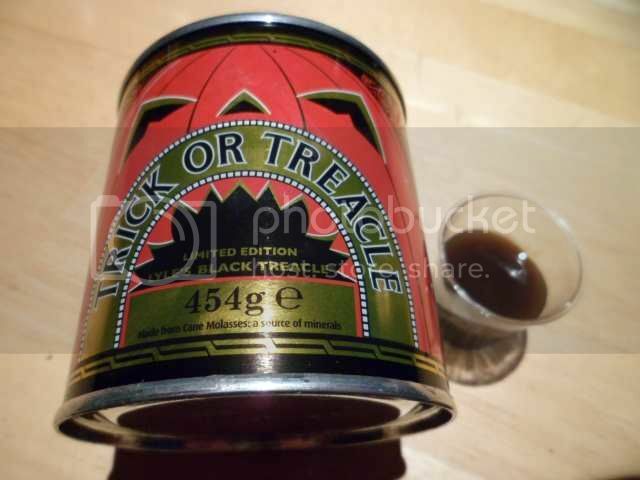 Treacle. I included it because I felt it was technically a sugar syrup of sorts. It does work, but it's what could be classed as an "aquired" taste that might be enjoyed by people who like Jagermeister. It was OK to try, but not something I'd choose to drink often. If I'd bought a bottle of it out of a liquor store it would have been on the shelf in a cupboard quite quickly. 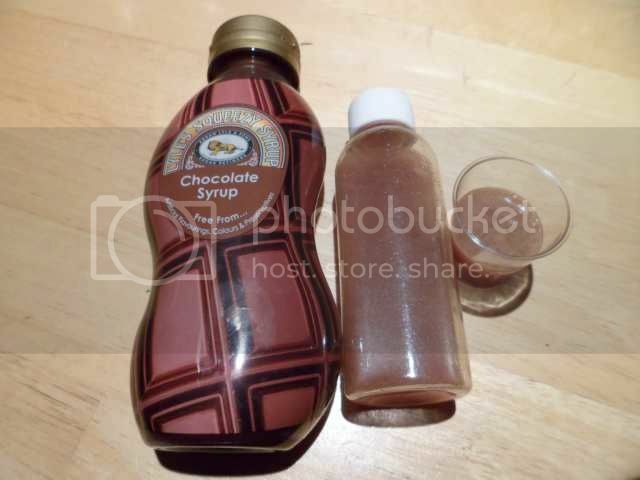 The chocolate flavoured dessert syrup worked very well. Very sweet with a strong creamy chocolate taste. This has to be shaken before each use as the cocoa tends to separate and settle. 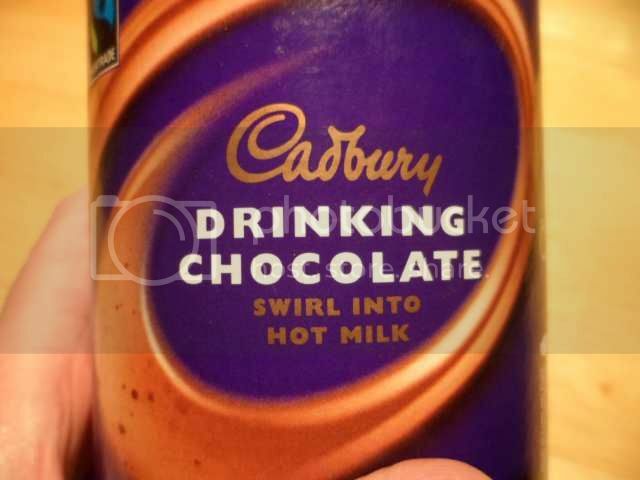 Drinking chocolate was very good. Drinking chocolate is often just 75% powdered sugar, 25% cocoa powder and a tiny quantity of vanilla flavouring. The cocoa settles out quite easily and for best flavour it is best left sitting for a while to allow the flavour to infuse from the cocoa solids. 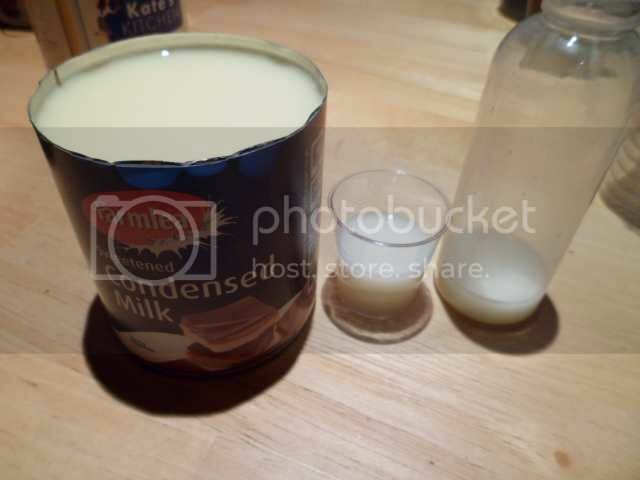 Condensed milk was amazing. VERY creamy due to the high milk content. Very much like a white chocolate liquer. It's worth mentioning at this point that the high sugar and alcohol levels act as potent preservatives, so these concoctions can be made and bottled in advance and stored in a refrigerator if desired. If diluting with water, I'd recommend that the mixtures be made at full alcohol strength and diluted as needed, since the higher alcohol level will make the liquers keep better. Caramelised condensed milk was another winner, since it's basically condensed milk that has been heated to partially caramelise it. This was very reminiscent of an Irish cream type liquer. 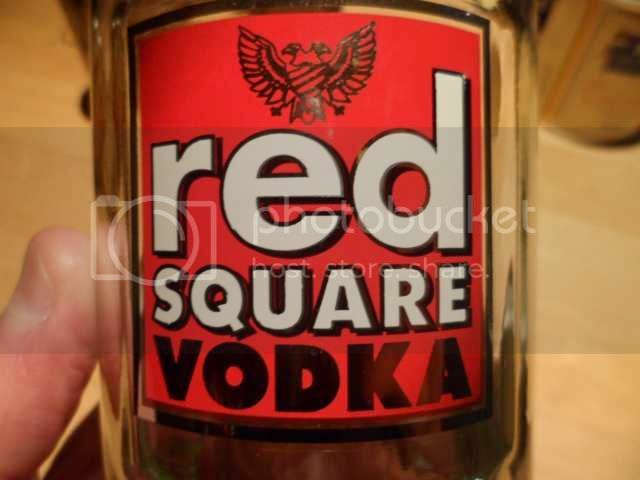 I thought it wasn't going to be easy to dissolve in the vodka for some reason, but it did so rapidly. Honey was a very high scorer. 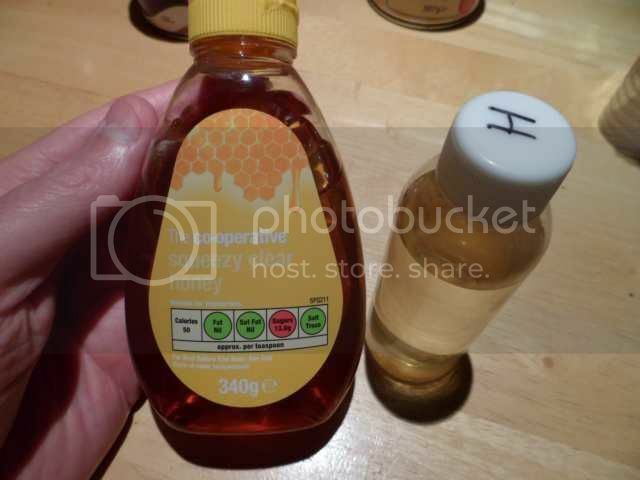 Use the clear honey in a squeezy bottle to assist dispensing it into the mixing bottle. It's the nature of honey that even the clearest type will still contain small quantities of insoluble particles of wax. It's best to shake the bottle of honey liquer before each use to avoid ending up with a sediment on the bottom of the bottle. Honey works well with vodka, rum and whisky. 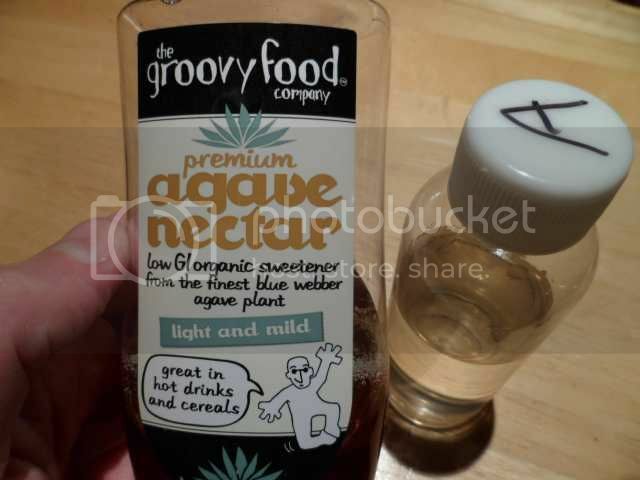 Agave nectar is a liquid collected from agave plants and used as a natural sweetener. I had high hopes for this, but it wasn't as good as other sweet syrups. I wonder if this has anything to do with the addictive quality of traditional sugar versus these supposedly healthier types? 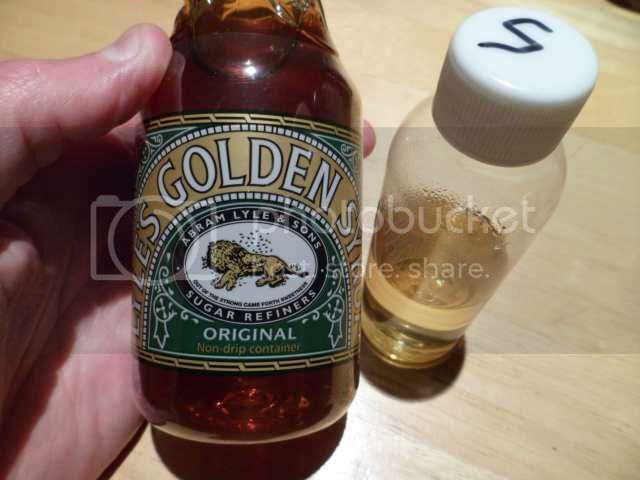 Conversely I thought that golden syrup was not going to work as it has quite a strong metallic element in the taste. I was wrong. Plain golden syrup worked very well. I like maple syrup because of it's deep and complex taste. But I really didn't think it worked well with a spirit. 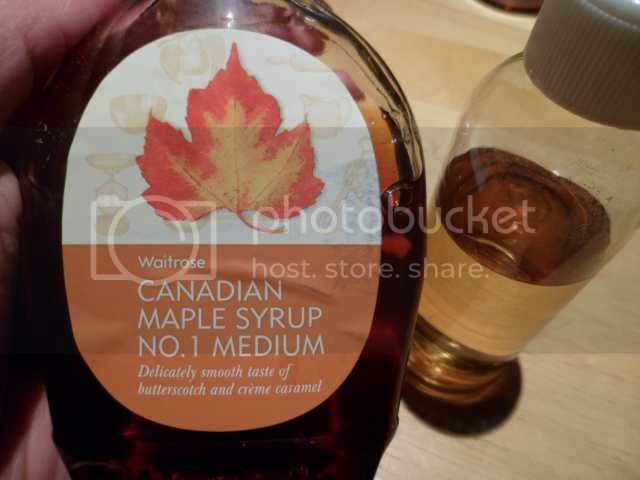 The unique taste of maple syrup was overpowered by the alcohol. It's very expensive in the UK, so I was wary of wasting it. 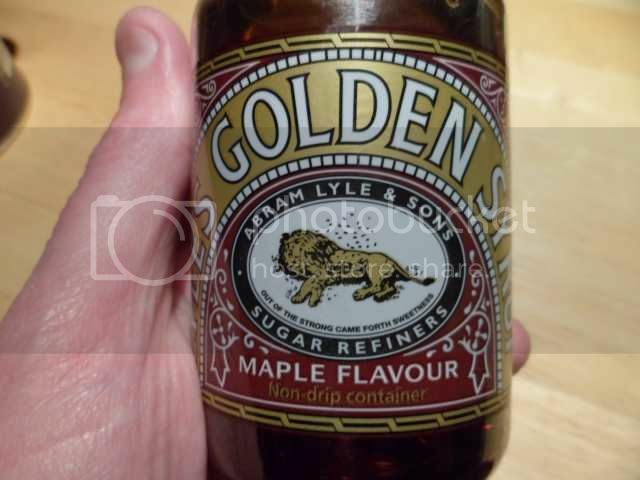 Maple flavoured golden syrup is an awful alternative to actual maple syrup, but did actually work better as a liquer ingredient. My absolute favourite of the flavoured syrup based liquers. 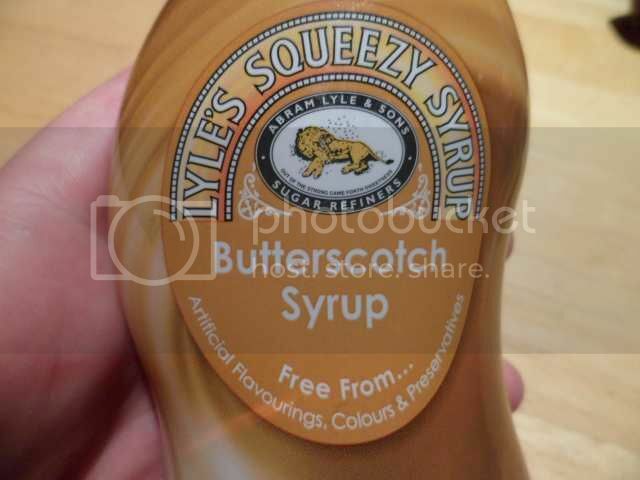 The butterscotch flavoured syrup made a really nice liquer with a strong rich buttery taste. There are loads of other flavoured syrups that I could have tried. I didn't try any of the fruit flavoured syrups at all. It should also be noted that vodka is a very good solvent for oils and sugars, so you can actually dissolve candy in it to add sweetness and flavour. 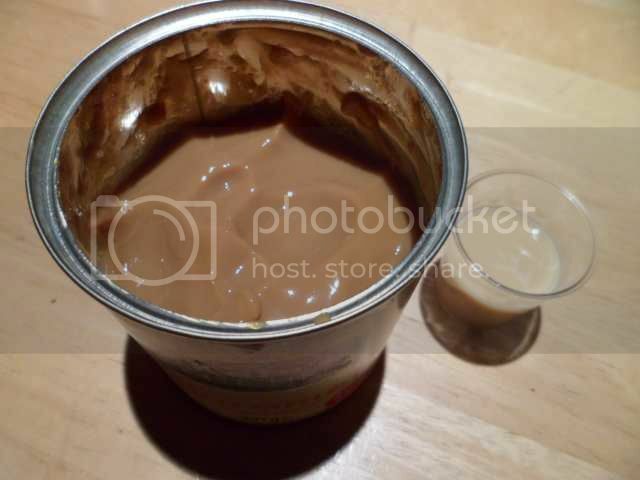 Some may require that the vodka bottle is heated gently in a bowl of hot water to help speed up the dissolving of the candy (you can chop up Mars bars and dissolve them in this way). Don't heat the bottle directly as this carries a risk of the vodka boiling and the bottle exploding! Back to the project index.